Tualatrix Chou, the developer behind the Ubuntu Tweak application, a very useful utility for all users of the Ubuntu Linux operating system, announced today, April 25, that a new version is available for download, supporting the brand-new Ubuntu 13.04 (Raring Ringtail) operating system. Beside the support for Ubuntu 13.04, Ubuntu Tweak 0.8.4 also fixes a few annoying bugs, such an unexpected issue that appears when installing apps through Ubuntu Tweak, correctly upgrade the path of scripts on Ubuntu 13.04. 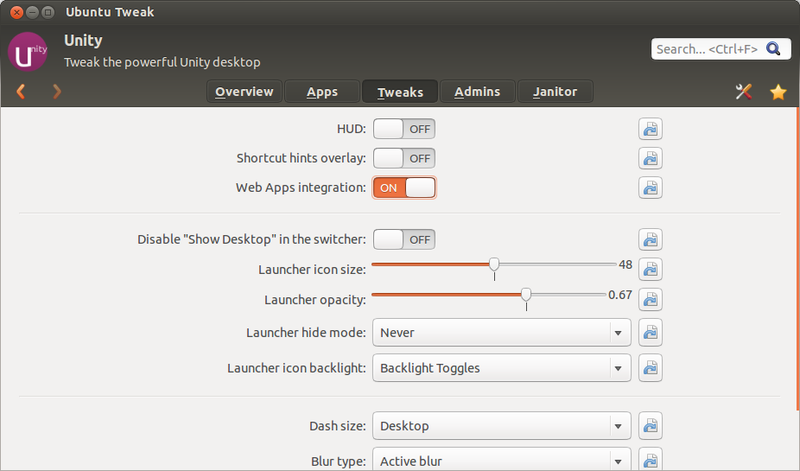 Ubuntu Tweak 0.8.4 also fixes rare crashes that appear while updating the software list, the Janitor only shows “System” issue, and the window button tweak error in Ubuntu 13.04. “You may encountered unexpected issues while installing apps through Ubuntu Tweak: download fails, network is down, then Ubuntu Tweak will popup an error dialog to tell the truth.” “In the old versions, Ubuntu Tweak will hang after you click the “Close” button, and you have to force close it and launch again. In 0.8.4, this bug is finally fixed! Now enjoy with installing third party apps without any pain,” said Tualatrix Chou in the official release announcement.